New tires will always set you back more than a few dollars. But buying good tires is a must. Most people don't realize that tires are the single most important safety feature on any vehicle. 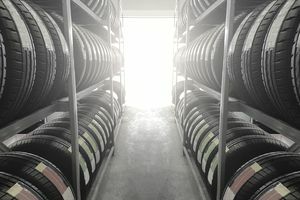 Your tires provide the only connection between your car and the road, so skimping when buying tires could put you at risk. But that doesn't mean you have to pay top dollar. Saving on tires has more to do with timing than looking for specials or trying to find a less-expensive brand. And here's the secret: Buy your tires in October or April to save the most on your new set of wheels. Tires go on sale in October to encourage consumers to buy before winter and again in April when the weather gets warm enough for people to start thinking about road trips and joy rides. Tires need to be replaced before the tread gets below 2/32 inch—do it sooner to maintain proper braking and handling—or when they have expired. Tires have a code stamped on the side that you can use to determine their age. Don't wait to replace unsafe tires just because you want to catch a sale. Safety is more important than saving a few bucks. If you aren't going to be able to time your purchase with the October or April sales, there are other ways to save money on tires. You'll have a bigger selection to choose from and may be able to take advantage of a closeout deal if you buy online. Of course, this means you'll have to have a way to get the tires to a local tire shop for mounting. That's not a big deal if you have a truck or minivan, but it could prove problematic if you own a small sports car. If your tires have a defect or wear out prematurely, the manufacturer will prorate your next set. But, you'll have to have the paperwork required to file a complaint. Some tire companies offer additional coverage with your purchase. And, many shops will repair flats and rotate your tires for free if you buy a set from them. While that won't save you on the initial cost of tires, it can help you avoid additional expenses later. Used tires are cheaper, but there's usually a reason for that. Buy a set of used tires, and in a short time, you'll probably discover that someone got rid of them because they're not perfectly round, create a lot of road noise, or have some other defect. While it's illegal to sell expired tires, that doesn't mean it doesn't happen. So, if you decide to go this route, check the dates and check for recalls. There's no better way to save money on tires than to take care of the set you have now so that they'll last longer. Keep your tires properly inflated and rotated, so they don't wear out before they should and be on the lookout for uneven wear. It could be an indication of an alignment issue that you need to fix. Improper wheel alignment is one of the biggest reasons tires wear out early.